In this chart of the S&P 500, we can see the tails on the candlesticks have been rather long for the last five trading days while the closing prices have shown little gain or loss. As shown by Aroon, however, the primary trend is still very strongly up for this index. 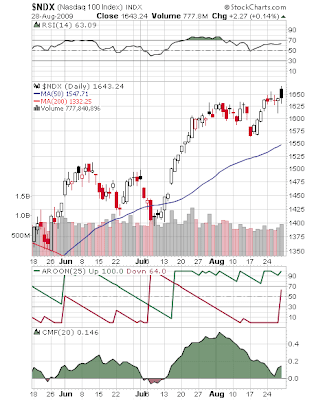 We have used the Chaikin Money Flow indicator to evaluate whether the trend may be about to change. As can be seen at the bottom of the chart, CMF has been trending downward for most of August. This divergence with the main price trend is generally considered a warning signal that the current trend may be close to being exhausted. The next chart shows the same indicators applied to the NASDAQ 100. In this case we get nearly the opposite result! Here again Aroon shows the primary trend is up but it appears to be weakening. Though the green Aroon UP line is still at its maximum value (this is very bullish), the red Aroon Down line has made a significant turn upward (a bearish development). All during the month of August, CMF has shown a divergence with the primary trend until the last two days when CMF finally started turning up. 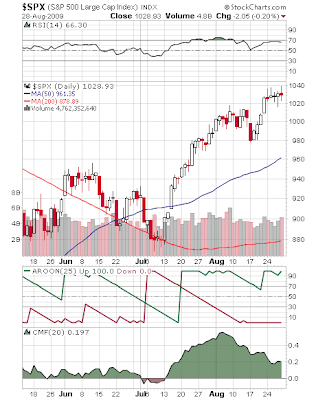 With respect to the S&P500, Chaikin Money Flow would seem to be telling us that the index is about to drop. We are getting a similar signal for the NASDAQ, that is, if you can ignore the last couple of days where CMF gained. My interpretation is not that we are going to get a significant drop but that there is about to be another rotation in market leadership. The NASDAQ has recently shown the most weakness with CMF nearly going negative this week and the Aroon Down indicator strengthening. It may seem counter-intuitive but I think this recent negativity paves the way for the NASDAQ to again take the leadership role in this market. Here's where I have to pull in some fundamental data in order to make the argument. With good numbers for tech in the Durable Goods report this week (read our post about it here) and Intel's bright outlook (read about it at Barron's), I think we will see investors begin to gravitate away from financials and back to tech. Indeed, the frothy action in financials recently is causing many observers to predict the market, or at least the financial sector, is ripe for a fall (see this post from Peridot Capitalist as one of several examples). I suspect this rotation in leadership will pressure the S&P 500, allowing its CMF to get down to a more over-sold level. In the meantime, this rotation should support further gains in the NASDAQ and we could see its primary trend continue upward, confirmed by an increasing CMF.